The Book Club is the club for you if love reading books and talking about them. We read a book each month and discuss the month’s book at our meeting. We choose books from various genres, including apocalyptic fiction, science fiction, historical fiction, mystery, Christian fiction, and fantasy. Some months club members each choose their own free choice book, and they present summaries of their selections to fellow club members. Our meetings always begin with fun and engaging lunch fellowship involving small group discussions. We continue with large group discussions of the characters, settings, plots, and literary elements of novels. Book Club members are offered the opportunity to volunteer to serve our media center after school a few times during the year. The Castle Crazies exist to promote school spirit within the Middle School Sports. At our monthly meetings we eat lunch together and then we have 2-3 games that involve all of the attendees. This promotes school spirit within the MS students. We then make team posters and display them in the middle school hallways to inform students of key home games. We do this for each middle school sport in the Fall, Winter and Spring. At these games we cheer and support our MS teams. We also do a halftime contest at the Boys and Girls Basketball games. 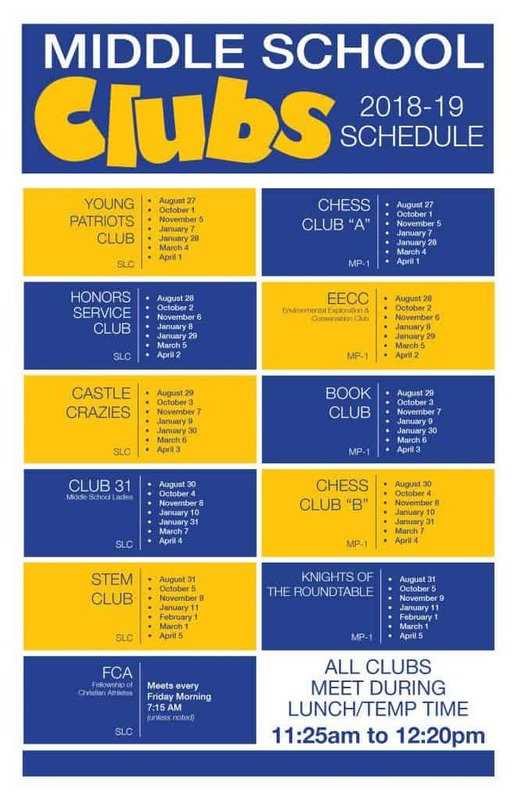 For students interested in the game of chess, NRCA offers two levels of club play. For beginners, Chess Club B provides ongoing instruction and review of the basic rules and goals of the game. Chess Club A is for intermediate and advanced players seeking tougher competition. Both clubs include rankings and matched play at each meeting. Players learn sportsmanship and build friendships as they enjoy a classic game in an atmosphere of Christian fellowship. Club 31 is designed for middle school young ladies. Proverbs 31 provides a great example about being a godly woman. The purpose of Club 31 is for our middle school young ladies to grow in their relationship with their Heavenly Father and learn what it means to be a godly woman through studying Proverbs 31. The desire is for our young Lady Knights to seek the Lord, reject wrong and harmful behavior, and point others to Christ with their words and actions. The Environmental Exploration & Conservation Club is tailored to the middle school student, providing a path to achievement in leadership, personal growth and success through environmental exploration and conservation education. The EECC is for students who have an interest in exploring God’s creation and a desire to be good stewards of His creation; EECC also welcomes students who aspire to have careers as teachers, doctors, scientists, business owners and more. The EECC desires to develop students’ unique talents and explore their interests in a broad range of environmental exploration and conservation, to create an informed community of young citizens who are actively engaged in environmental issues facing our planet, and who are well-equipped to become lifelong ambassadors of God’s environment. The Fellowship of Christian Athletes strives to see the world impacted for Jesus Christ through the influence of coaches and athletes by presenting to coaches and athletes, and all whom they influence, the challenge and adventure of receiving Jesus Christ as Savior and Lord, serving Him in their relationships and in the fellowship of the church. Middle School FCA meets every Friday morning in the Student Life Center. All middle school students and coaches are welcome. FCA is led by a team of student leaders who plan and execute each meeting. We have breakfast, play a game, honor a team of the week, and hear from a great speaker every week. This club gives members of the National Junior Honor Society the opportunity to serve in their school and community. Participating students work on planning and implementing different types of service projects from on campus throughout the school year. The club will also choose an off-campus service project to assist an area ministry or charity on one Saturday morning. Members learn more about Christian compassion and helping others as they serve together. Knights of the Roundtable is a club designed for middle school young men to understand what it means to be a true man of God, from a biblical perspective. Knights of the Roundtable will study great men from the Bible and gain life application in order for these young men to understand the true meaning of what it means to be a true man of God. Knights of the Roundtable will use Proverbs 27:17 “Iron sharpens iron, and one man sharpens another.” ESV as their key verse from the Bible. This club will embody the academic disciplines of science, technology, engineering and mathematics. The acronym is STEM, and the academic disciplines can include the following: physics, chemistry, biology, mathematics, statistics, computer science, applied mathematics, robotics, engineering [i.e. electrical, mechanical, civil, industrial, aerospace], optics, nanotechnology, nuclear physics, bio-mechanics, atmospheric sciences, instructional technology and more. STEM education helps to cultivate interest in the sciences and mathematics. This initiative uses technology to encourage interest in STEM fields. As a club, we will be doing many hands-on experiments and get a chance to connect their experience to real life. We will learn about new technology, implement change, and develop new innovative ways to think or reach the intended goal. We will use these experiences to link to our community in some effective way. This is a marvelous way to build on the talents God has given us and use them to impact society for the better, always giving Him the glory. In the Young Patriots Club, students have opportunity to discuss and present on current events in National and State politics, as well as looking at our politics from a historical perspective. We look at our role as Christians in the political life of our country and state. We wrap up the year with field trip to downtown Raleigh to visit our North Carolina seat of government. The Biology club is a fun way to learn more about science in a relaxed setting. Students eat lunch and carry out activities such as making “edible cell cookies”, building terrariums, and playing science trivia games. Students also design and order club shirts. The club is a great way to meet friends and spend time discussing how God uses science to communicate His truth to us. The Book Club is designed for students who love to read. At our meetings, students enjoy conversation about books, characters, and genres they love. Activities include games, crafts, and student-led discussion. Students enjoy talking about and being introduced to new books. The service project for the year is helping organize and file books received by our Media Center. The main purpose of Castle Crazies is to support our student-athletes throughout the year. We also encourage school spirit by having the students dress in various themes at games throughout the year. Students involved in Castle Crazies sit together in the student section for the games. The club officers lead the students in chants and cheers during the games and organize activities during halftime games. The Castle Crazies service project is a toy drive during one of the basketball games in December. The toys are donated to the Raleigh Rescue Mission. NRCA hosts a chapter of the American Chemical Society ChemClub. In the three years that we have had the club, our roster has averaged around 75 students each year. ChemClub gives high school students a unique opportunity to experience chemistry beyond the classroom. Students engage in activities that enhance their understanding of the science, get them involved in the community, and help them better appreciate how chemistry plays a role in our everyday lives. Our monthly meetings open with engaging chemistry experiments and we plan our outreach activities. Each year the students plan and implement an Elementary science night to share their love of science with the younger students. Members of the ChemClub also participate in our annual blood drive through direct donations of blood or helping to organize. 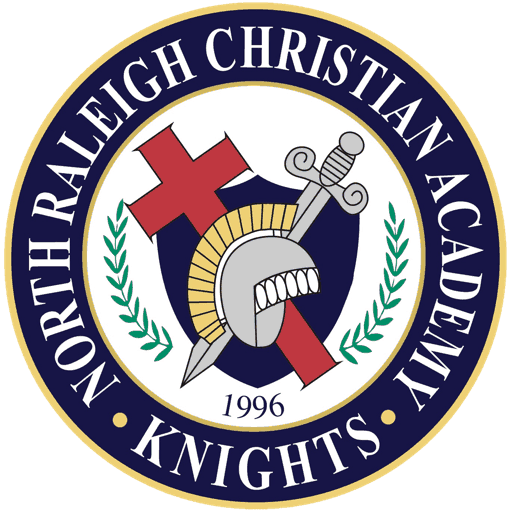 Here at NRCA we have begun the “Knight-Time” as students gather at Lunch to do battle! Chess is a game that utilizes mental strength, reasoning abilities, strategy, forethought, creativity, a healthy desire to win, discipline, strength of character, etiquette, only to name a few of the dimensions of this timeless game. No game is the same as another and pitting your skills against different people…it can be addicting. Yes, it is just a game, but it may be the best game ever invented. Give it a try. Come play a game with someone of your skill level, or perhaps to beat the best in the room! This club aims to share, learn, teach, and enjoy all the cultures of the world, to focus on building knowledge and relationships, and to correct misunderstandings about cultures other than your own. The Ecology Club is open to all students sharing an interest in learning about and improving our environment. The club will seek to connect students to real world solutions for human induced problems that affect our environment. Members should be self-motivated, show an interest in solving ecological problems and desire to be better stewards of God’s Creation. Topics of interest will include sustainability, biodiversity, “green living”, conservation, alternative energy sources, and ecology/environmental science careers. Members will be involved in environmentally related service projects, as well as NRCA’s annual Knights Care for Creation Day. 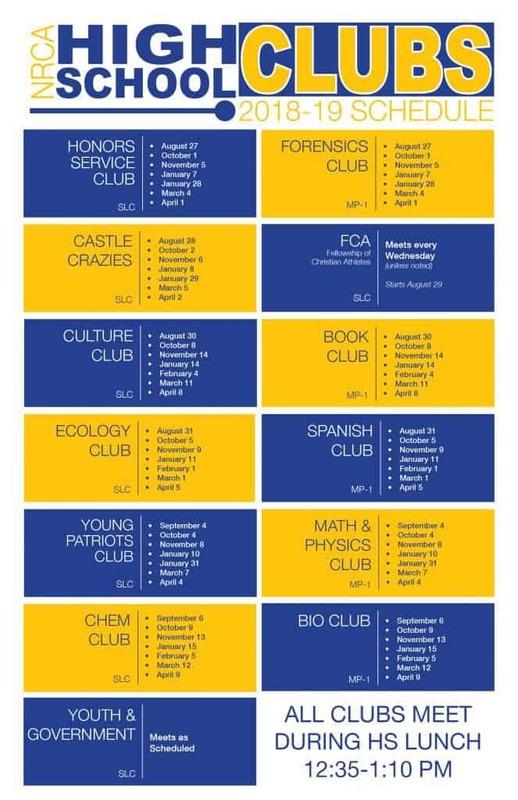 FCA is one of our largest clubs. Although FCA stands for Fellowship of Christian Athletes, one does not have to be an athlete to attend. Each week, students are given time to fellowship and are given a motivational message by someone who has excelled in in the area of athletics. Students hear from their peers, alumni, college and pro athletes. This is a fanatic club for those who enjoyed being challenged by others. The Forensics Club introduces its members to one of the most exciting applications of scientific disciplines: criminalistics. Members will not only learn the techniques used to discover and analyze evidence from fingerprints to DNA to glass fragments and more, but also the underlying scientific principles that support those techniques. Hands-on activities will allow members to apply the techniques in simulated situations. The Honors Service Club is designed for students who love to be involved in community service activities. During the monthly meetings, students look for, talk through, and plan to serve at various events around the Raleigh area. This group is a fantastic way to develop community involvement, as well as a place to connect with others who have the same passion. The Math and Physics Club is open to Juniors and Seniors who have an interest in these subjects. During our meetings, we discuss upcoming math contests, play some math and Physics games, watch videos that explore the history and applications of these topics, and practice for math contests. Our goal is to help students develop a deeper appreciation for these subjects and explore practical applications for the subjects in their lives. The Spanish Club creates opportunities for students to practice Spanish conversation and to increase their understanding of Spanish culture and customs. Students will be exposed to Spanish culture through Spanish films, trips to local restaurants and performances, crafts, guest speakers, and holiday celebrations. The club also provides opportunities for student leadership through peer tutoring and service projects for the Hispanic community. Young Patriot’s Club is a student-led group of young people who are passionate about our country. Everyone, from any nation, is welcome as we discuss and debate current topics and political subjects. We encourage our members to share their ideas as we come together to talk about important issues facing our nation and the world. Community service opportunities and an annual trip downtown to the State Capitol is planned for each year. YAG is a YMCA program that gives high school students the opportunity to serve in model governments at the local, state, and national levels. Each February, NRCA 9th-12th grade delegates join with students from all over North Carolina for a four day conference to model a state government. Each student chooses a role in one of the three branches of government. Students can also select roles from media and mock trial. They prepare for Conference from August through February during bi-monthly lunch meetings, Regionals (Oct.), Defend the Bill Night (Nov.), and Pre-Conference (Dec.). In preparation for State Conference, students are trained by NRCA advisors, an A.E. Finley YMCA advisor, and other experienced students. NRCA students have been elected as NC Youth Governor for three years in a row. In addition, students can apply for National Conventions held during a week in the summer. Several NRCA students have participated in Conference On National Affairs (CONA) and National Judicial Conference (NJC). The NRCA delegates won National Champions at the NJC mock trial in 2014. YAG has become a very popular club at NRCA with 125 delegates or more in the past several years making it one of the largest (or the largest) delegation at the State Convention. It provides an opportunity to be a light for Christ in the public arena. Students usually start out in YAG with a bit of apprehension when they think about writing a bill or speaking before other students, but they gain confidence and continue growing in their God-given abilities. They also enjoy the social aspect of YAG and the fun activities conducted at the State Convention. Whether they learn new writing or speaking skills, or rise to the position of governor, students who participate in YAG gain experiences that can help them through life.